Today we get our very first peek at a new Limited Release beer coming in 2019 from Boulevard Brewing in Kansas City, MO. This is Brandy Land and it will be a spiced imperial stout that is aged in apple Brandy barrels. The beer will hit 12.2%-AbV & 23 IBU and you’re looking at the 12oz bottle. For 2018, Boulevard did not issue a release calendar so stay tuned here for more info. Returning for a fourth year, Snow & Tell is our interpretation of a Scotch Ale or Wee Heavy. Ranging in alcohol from 6% up to 10% in more extreme examples of the style, Scotch Ales typically feature rich, caramel malt sweetness punctuated by spicy/herbal hops. At 6.3 ABV, Snow & Tell is composed of our base pale malt, crystal/caramel malt, amber malt and just a touch of Beechwood smoked malt from Germany. At just under 1% of the total malt bill, the smoked malt lends subtle complexity without overpowering the layers of caramel and toffee flavors contributed by the crystal malt. Hopped with Magnum, Chinook and Saphir, Snow & Tell sees brief aging on medium toasted virgin oak chips at the end of fermentation. Opening with aromas of fig, raisins and caramel/toffee Snow & Tell stretches out, enveloping the palate with a lingering malt sweetness that transitions into spicy/herbal hop flavors coupled with a drying, oaky character. The hops are fairly minimal at 25 IBUs, but serve to keep Snow & Tell from becoming cloying. Look for Snow & Tell in six-packs of 12oz bottles and on draft where you normally find our seasonal releases. Deliveries of bottles and kegs will begin in the Greater Kansas City Area on Monday, October 29th. Other cities that normally see Boulevard seasonal beers like Hibiscus Gose and Tough Kitty Milk Stout should expect to see Snow & Tell in the coming weeks. Please note that we do not have access to our distributors’ delivery schedules and will be unable to confirm when Snow & Tell is available near you. This morning we get our first look at the packaging for a returning favorite from Boulevard Brewing in Kansas City, MO. This is their Chocolate Ale and this on-again-off-again will return as a collaboration with Christopher Elbow chocolates. This ale brewed with cacao nibs, chocolate and vanilla extracts will return after being on hiatus for 2017. The beer will hit 9.1%-AbV & 24 IBU and you’re looking at the 12oz bottle. Boulevard did not publish a 2018 calendar for their beer, but I suspect this beer will be coming in 2019….but stay tuned. 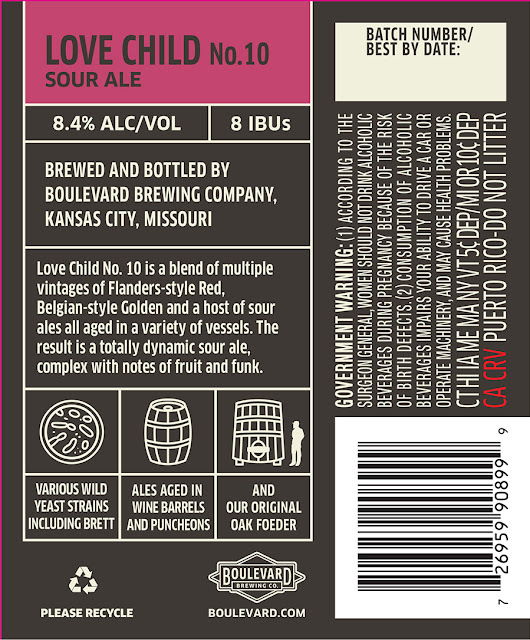 This morning we bring you a bunch of new beers coming to a bunch of series from Boulevard Brewing in Kansas City, MO. Paw Paw’s Got A Brand New Bag is part of the Brewhouse One Series and it is a barrel-aged sour ale that hits 9.2%-AbV & 7 IBU (750ml bottles), Lickable Wallpaper is a sour saison aged on boysenberries (8.1%-AbV, 750ml bottles), Passionfruit Golden Sour is an experimental beer that hits 7%-AbV (16oz cans) & Pear Grisette is also an experimental beer that hits 5.9%-AbV (16oz cans). Stay tuned for more details. Here’s your very first peek at another new “Rye On” coming in 2019 from Boulevard Brewing in Kansas City, MO. This is Rye On Rye 6 and it is a rye ale aged in 6-year Templeton Rye Whiskey barrels. This beer will hit 12%-AbV & 33 IBU and you’re looking at the 12oz and 750ml bottles. Look for a 2019 release date. Our newest year-round beer, bursting with stellar tropical fruit flavors, touches down on shelves and tap handles starting next week! As we celebrate the beginning of a new year, we’re excited to introduce a brand-new year-round beer that will join our canned and draft lineups, Space Camper Cosmic IPA. The culmination of over a year of creative exploration of a relatively new take on India Pale Ales, Space Camper saw first life in our Tours & Recreation Center Beer Hall as TEST – El Dorado IPA. Boulevard fans (and BLVDians alike) loved the beer so much that we knew we were on to something. 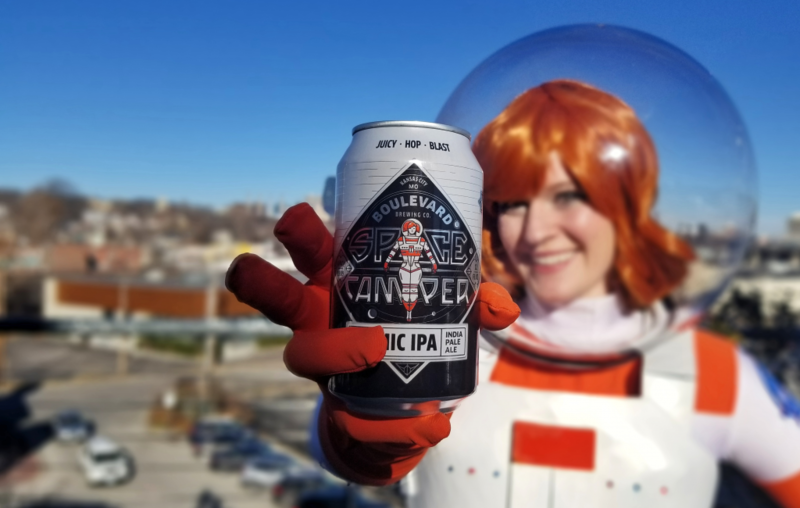 Available on draft and in six-packs of 12oz cans, Space Camper Cosmic IPA launches in the Greater Kansas City Area on Monday, January 7th and will soon be available nationwide. Please note that we are unable to confirm release dates outside the Greater Kansas City Area and will not have access to a list of locations that will receive Space Camper Cosmic IPA. Your best bet is to give your favorite local beer spots a call to see if they know if/when they’ll receive Space Camper. 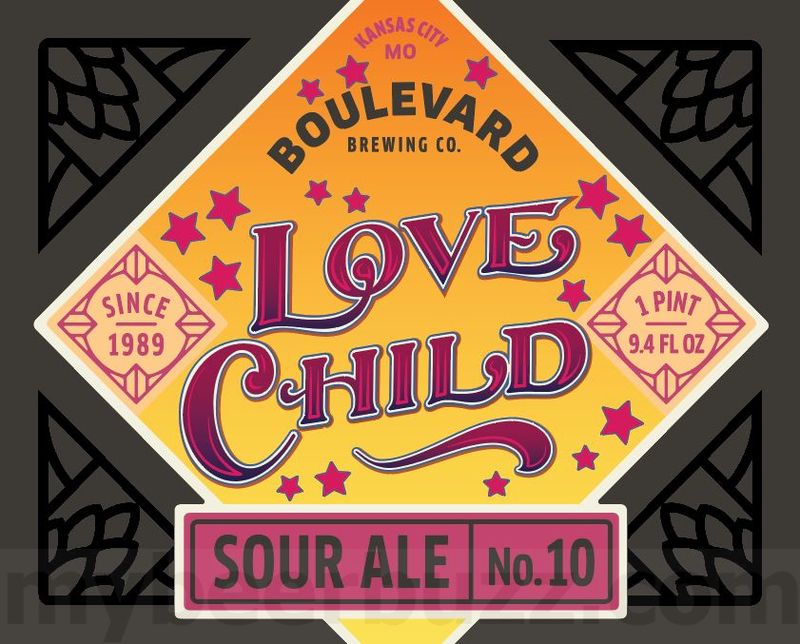 It’s only a keg label, but today we have a new cider coming from Boulevard Brewing in Kansas City, MO. This is Test Normandy-Style Hard Apple Cider and it will roll in at 8.5%-AbV. This is the 19.53-liter keg and stay tuned for more info. Today we have a new can coming in 2019 from Boulevard Brewing in Kansas City, MO. This is Easy Sport Recreation Ale and it will be brewed with tangerine peel and sea salt. This beer is aimed squarely at the “light” beer category and it will hit 4.1%-ABV, 99 calories and 4.5g of carbs per 12oz serving. This is the 12oz Ball can and stay tuned for release info. 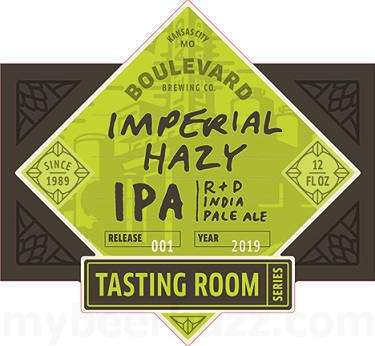 Today we have several new bottles coming to the 2019 Tasting Room Series from Boulevard Brewing in Kansas City, MO. Blonde Ale will hit 5.5%-AbV & 16 IBU and Hefeweizen Wheat Ale will hit 5.5%-AbV & 35 IBU. These are both 12oz bottles and stay tuned for more 2019 releases. Yeah looks like a lot of stores have it in mass quantities. Hear it is northing special from the people who tried it already. So not going to pick any of it up. Today we have a new 2019 Limited Release beer and several Tasting Room Series beers coming from Boulevard Brewing in Kansas City, MO. 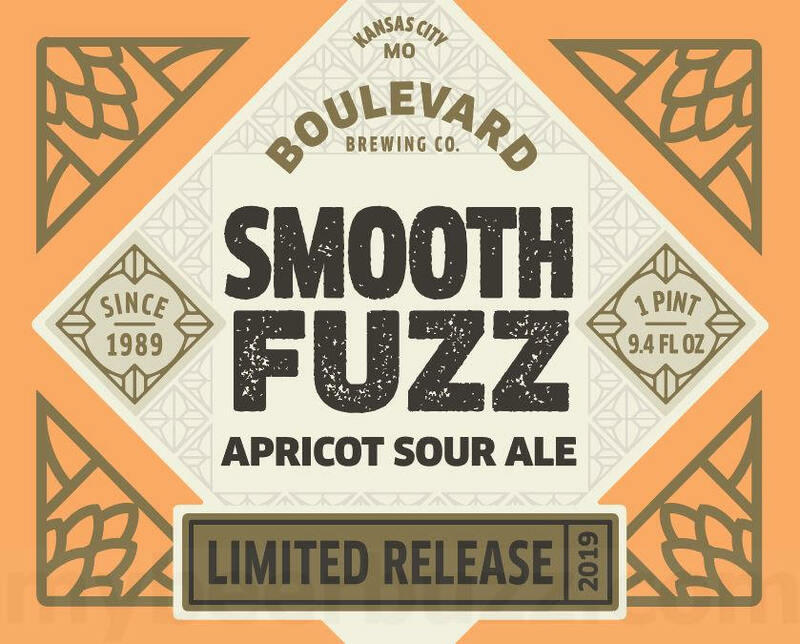 Smooth Fuzz will be an apricot sour ale that will hit 8%-AbV & 8 IBU (750ml bottle Limited Release). 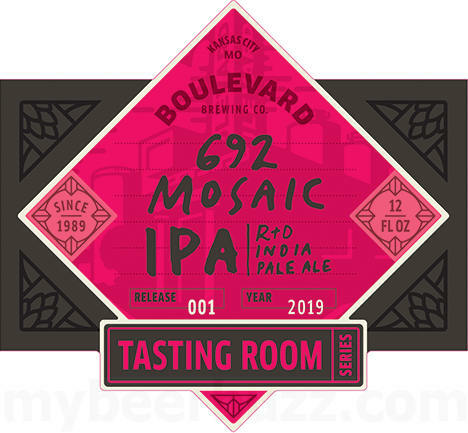 We also have Tasting Room Series 692 Mosaic IPA (12oz bottles, 5.9%-AbV, 50 IBU) and Tasting Room Series Imperial Hazy IPA (12oz bottles, 8.5%-AbV, 35 IBU). Stay tuned for more. This morning we get our very first peek at the 2019 version of a returning sour classic from Boulevard Brewing in Kansas City, MO. 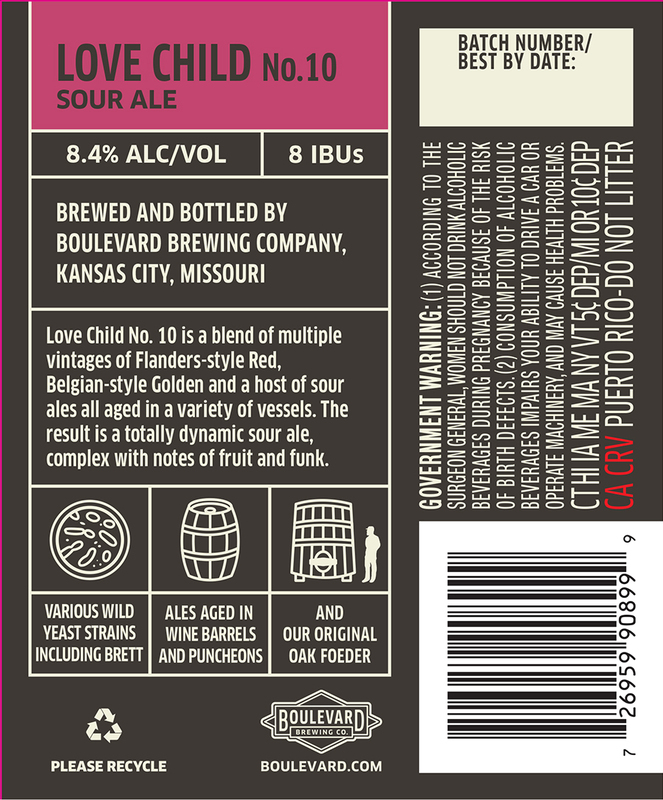 This is Love Child No 10 and this sour ale is a blend of multiple vintages of a Flanders-style Red, a Belgian-style golden ale and a number of different sour ales all aged in different varieties of vessels (mostly wine barrels and puncheons). The resulting beer will hit 8.4%-AbV & 9 IBU and you’re looking at the 750ml bottle. Stay tuned here for release info. Boulevard Brewing Co. has built a nationwide following for its iconic Tank 7 and Pale Ale beers, but now the brewer is launching its first line outside of beer. Boulevard has launched Fling Craft Cocktails, and it’ll initially offer four all-natural, low-calorie, low-carbohydrate and gluten-free cocktails. Fling Craft drinks will be sold in four-packs of 12-ounce cans. Fling will launch with four flavors – Blood Orange Vodka Soda, Cucumber Lime Gin and Tonic, Margarita and Mai Tai. Boulevard said the cocktails will cost $12.99 and will be sold in grocery, liquor and convenience stores across Kansas City. “Crisp, refreshing and crafted with care, they're ready for any adventure and will be available year-round in early April,” Boulevard said on its website. 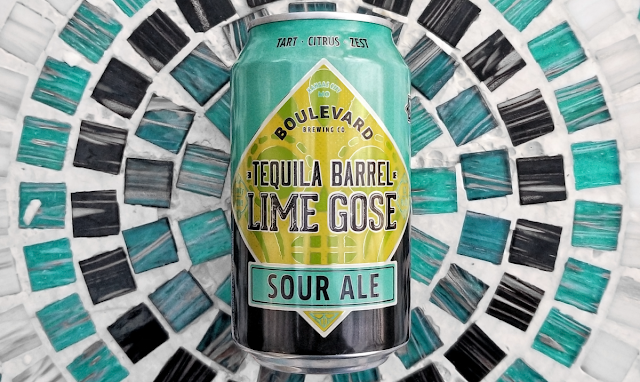 Boulevard also tapped into its local connections for its spirits, using 360 Vodka from Weston, Builders gin from North Kansas City’s Restless Spirits Distilling Co. and American Agave from Mean Mule Distilling Co. in the Crossroads. MAN, IT’S A ‘COT ONE. A blend of Belgian-style ales aged in oak barrels and foeders for up to 36 months with a final rest on whole apricots, this fuzz is so smooth. Look for Smooth Fuzz to hit shelves and tap handles in KC starting May 6th, with other regions in our national distribution footprint to follow.